My fundamentalist friend was surprised to hear that my parish was having a Halloween party. Confused at best, my husband and I passed on the parish Halloween party, much to our friends’ disappointment. Despite the protest of our boys for decorations of ghosts and black cats, our home was carefully adorned with scarecrows and smiling pumpkins. We even began to wonder if we should let the kids go trick-or-treating, although we were heartsick at the thought of disappointing them. And, for another year, a large black trunk remained locked in our basement, silently enshrining a collection of costumes and decorations from parties we had hosted many years ago. Before we were so confused about Halloween. Finally, wanting some answers and wanting to be loyal to our faith, I decided to do some digging into what this bizarre holiday was all about and whether we as Catholics should have anything to do with it. My research took me back to the ancient Celts who lived in the British Isles. Avid followers of nature and the cycles of life, the Celts observed that in late October plants died, animals disappeared (into hibernation), days grew shorter and nights grew longer. They attributed this death like state to Samhain, their god of the dead. They feared that Samhain would slay the sun god, leaving the world in total darkness and releasing fearful spirits to roam the earth and create mischief. Therefore, every year from October 31 to November 1, the Celts would celebrate a feast to their god of the dead. They believed evil spirits could be pacified with edible treats or scared off with bonfires (or “bone” fires, kindled from the dried skeletons of sacrificed animals) set ablaze on outdoor altars. People would set out lanterns of carved turnips along with food to guide their family spirits and make them feel welcome. The head of each household would carry a burning coal from the bonfire and light a new fire in the home to further ward off evil spirits. During this journey, the person wore a wear mask and costume to fool the spirits. Okay, I thought. That explains the tradition of Halloween costumes, pumpkins, and trick-or-treating. But what does this have to do with the Church? Upon further investigation, I discovered that the early Church – after it had survived centuries of persecution by the pagan Roman Empire and become the official state religion – made deliberate efforts to announce its victory over paganism. This was primarily achieved by replacing pagan symbols, feasts and places of worship with Christian ones. In the same way that Christmas and Easter took the place of pagan feast days, October 31st and November 1st were also earmarked for Christian celebration. In the ninth century, the Church officially designated November 1 as All Saints Day, a celebration commemorating all the saints. The night before became known as All Hallows Evening (or Hallowe’en for short), a holy vigil to draw attention to the following day. Over time, different cultures added to the evolution of Halloween. Medieval beggars knocked on doors for “soul cakes” in exchange for prayers for the household’s deceased members. Costumes became a way for people to participate in pageant form in the story of life, death and that which may happen in the hereafter. Brought to this country by Irish and English immigrants, Halloween eventually lost its religious significance for most people, becoming a purely secular event. Armed with this information, I now saw the value in reclaiming Halloween as the holy celebration it was intended to be. I realized that it was OK – even important – to recognize that the devil, demons and evil do exist. It was our responsibility as Catholics to teach our children what life and death are really all about and why it is so necessary to pray for our brothers and sisters in Christ who are no longer with us. My husband and I began by giving an accurate account of the holiday to our children before the excitement of collecting bags of candy all but obsessed them. I’m not sure they totally understood everything we told them, but we plan to make education a part of our annual Halloween celebration. In my quest to learn more about the fascinating history of Halloween, I discovered some excellent opportunities for evangelization, a task Pope John Paul II has urged us all to do. Instead of following commercial trends in terms of costumes, try dressing your children as saints or characters from the Bible. 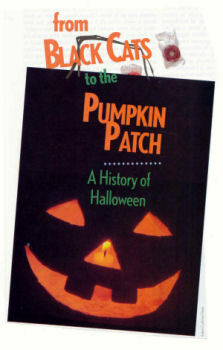 Hand out correct information on the history of Halloween along with your candy treats. Put religious stickers on treat bags. Initiate a three day celebration of life, death and eternity in your parish with Masses and memorial services. Celebrate with a traditional parish Halloween party. I even heard of one family who exchanged thank-you notes for the treats they received, wishing the candy givers a happy All Saints’ Day and promising to pray for their deceased family members. As for me? I decided to write about it. Enjoy Halloween with its history and traditions now that its truth has been unmasked.